Upon arrival at the Center, snake #19-0155 was examined by the veterinary staff . The male snake appeared bright, alert, and responsive. The staff assessed multiple abrasions encircling the middle third and the cranial third of his body [the portion of his body closest to his head]. Additionally, they noted abnormal shedding [known as dysecdysis] and abrasions on the top of the snake’s head. These injuries are commonly seen in snakes who become entangled in netting. The veterinary staff cleaned and flushed the wounds and started the snake on a regimen of fluids, antibiotics, pain medication, and an anti-inflammatory. They planned radiographs and surgical debridement [removal of dead tissue] of the wounds later in the week once the snake was stable. On March 18, Dr. Peach performed surgery on Eastern Ratsnake #19-0155 to clean and debride the wounds. After the wounds were debrided, Dr. Peach sutured closed most of the wounds; one of the wounds nearest to the snake’s head was too large to be sutured without severely stretching the snake’s skin, so Dr. Peach left this wound open. The snake’s recovery from anesthesia was uneventful. The Center’s veterinary staff monitors the snake daily, checking to make sure the sutures remain clean and intact; they also clean and re-apply a bandage to the one open wound. On March 23, the veterinary staff began to notice a crusty discharge from the snake’s nares [nostrils] when performing their daily exams. 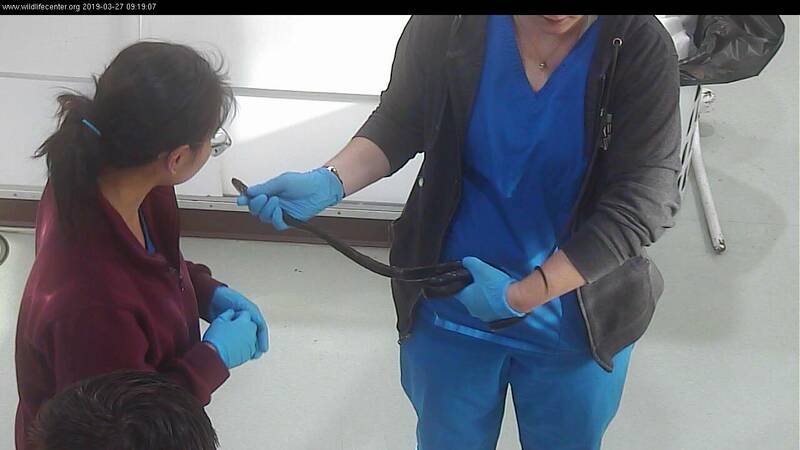 During the daily assessment on March 27, they identified a white discharge coming from the wounds, which could be a symptom of fungal disease in reptiles; the staff swabbed the discharge and will send the sample to an external lab to determine if the snake is suffering from a suspected fungal disease. Because fungal disease can be contagious between reptiles, the veterinary and rehabilitation staff are taking extra precautions when caring for this snake, including wearing designated gloves and working with the snake after other reptile patients receive care. On March 26, the veterinary staff also noticed that the open wound was dehiscing [opening at the edges] and would need to be debrided again and, ideally, sutured closed. The snake is currently shedding, so the procedure will be scheduled once he’s finished the shedding process. The veterinary staff will continue to examine Eastern Ratsnake #19-0155 daily for changes in attitude and to monitor wound healing. Your donation will help provide veterinary medical care to this injured snake -- and the 3,000 other patients that the Center will admit this year. Thank you! The snake’s infection worsened and unfortunately, on April 7, staff found Eastern Ratsnake #19-0155 deceased in his enclosure. SFD can cause a variety of problems in snakes, including thickening or crusting of the skin, abnormal molting, and facial disfigurement which can lead to emaciation; it can also cause nonlethal infections in snakes. Diseases such as SFD are one of the reasons why wild snakes should not be relocated; doing so can spread the disease to a new area.